The bold styling of the EXP 9 F provoked some negative reaction at the Geneva show. LONDON -- Bentley will display its EXP 9 F SUV concept unchanged at the Beijing auto show next month despite receiving mixed public reaction when the car was first revealed in Geneva. Some commentators said the SUV's styling was awkward and unrefined for an ultraluxury brand, but Bentley is not worried. "Getting global reaction from customers and the public is part of the process that the EXP 9 F is going through," a Bentley spokesman said. Bentley will go ahead with production of the EXP 9 F, Rolf Frech, the brand's engineering chief, told Automotive News Europe at the Geneva auto show earlier this month. The Volkswagen-owned UK brand needs the SUV to smooth out its sales cycle, Frech said. Currently, the Continental range accounts for most Bentley sales, with the flagship Mulsanne sedan making up the rest. "If you have only two car lines which go nearly equal up and down in their life cycle, then you have to look at what you have to do additionally. We think this is the right car to get a balance," Frech said. "It gives us an additional chance in emerging markets of the Middle East and China. I think we will get a lot of additional customers," he added. The EXP 9 F is powered by a twin-turbo 12-cylinder gasoline engine. A production version could also offer the company's turbocharged V-8 gasoline unit as well as a hybrid powertrain. In the first two months, China was Bentley's largest single market, with car sales of 324, up 66 percent from the same period a year ago and narrowly ahead of the United States, where sales increased 29 percent to 251. Global sales were 894, a rise of 47 percent. Sales of a Bentley SUV could hit 25,000 during its lifetime, with annual sales of 3,500 to 5,000, CEO Wolfgang Duerheimer told Automotive News Europe earlier this year. 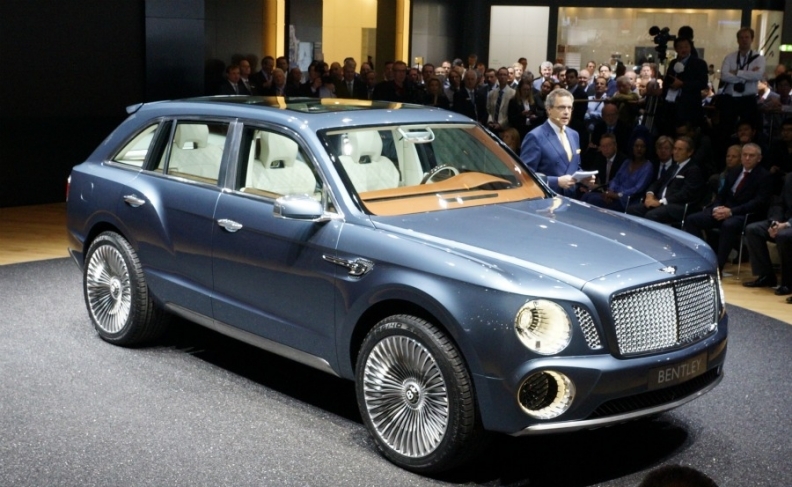 Bentley will have competition in the ultraluxury SUV niche. Lamborghini, which is also owned by VW, will unveil an SUV study at the Beijing show. Fiat's Maserati brand will build a production version of the Kubang concept it debuted at the 2011 Frankfurt auto show.